Attribution of authorship to Martin Luther is incorrect. 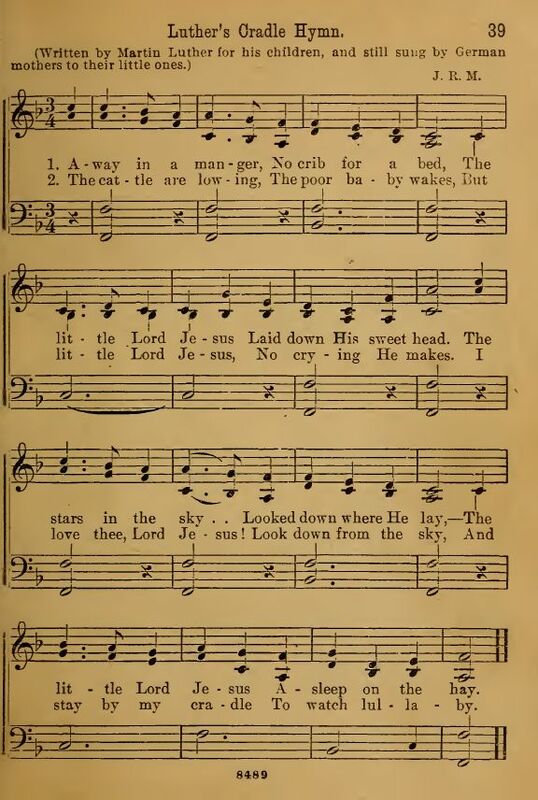 Verse 3: Unknown, circa 1892.
see: Not So Far Away In A Manger: Forty One Settings of an America Carol By Richard S. Hill. There is something known of Rev. Jonathan E. Spilman (1812-1896), a native of Kentucky, and evidently the composer of "Flow Gently Sweet Afton". The Register of the Kentucky Historical Society has a note about him .... This July 1971 article in turn references another article, which was also published separately as a book. The book is no longer in print nor readily available. That book is entitled "J.E. Spilman; Kentucky's long-lost composer of a world-famous melody rediscovered" by Judge Earl Reese Hoover (1904-1989). The book was published in 1968, but it was originally published in the above-mentioned "Register" in [July, 1968, 220, no. 11]. My thanks to John for sharing this information. When this carol first appeared is unknown, although Keyte and Parrott in The New Oxford Book of Carols suggest that it was likely a poem written and performed in a Church play about the German reformer Rev. Martin Luther, during the 400th celebration of his birth in 1893. The first known printing of this song was in a periodical of the Universalist Publishing House, Boston, The Myrtle, on May 3, 1884. (see right) There was no identification of the author of the two verses printed here, nor was any music printed, although it suggested the tune "Home! Sweet Home!" 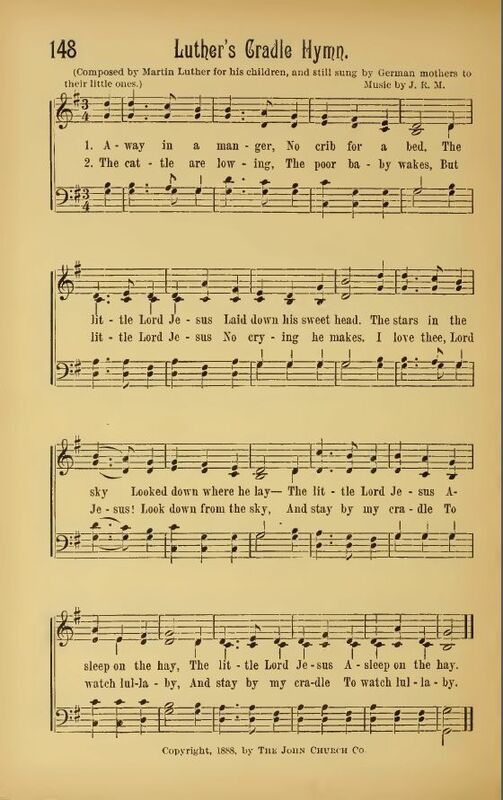 In 1885, the song appeared in Little Children's Book for Schools and Families by the Evangelical Lutheran Church (Philadelphia: J. C. File), this time with music "St. Kilda," by J. E. Clark (see left). Again, we have the first two verses, and no identification of the author. 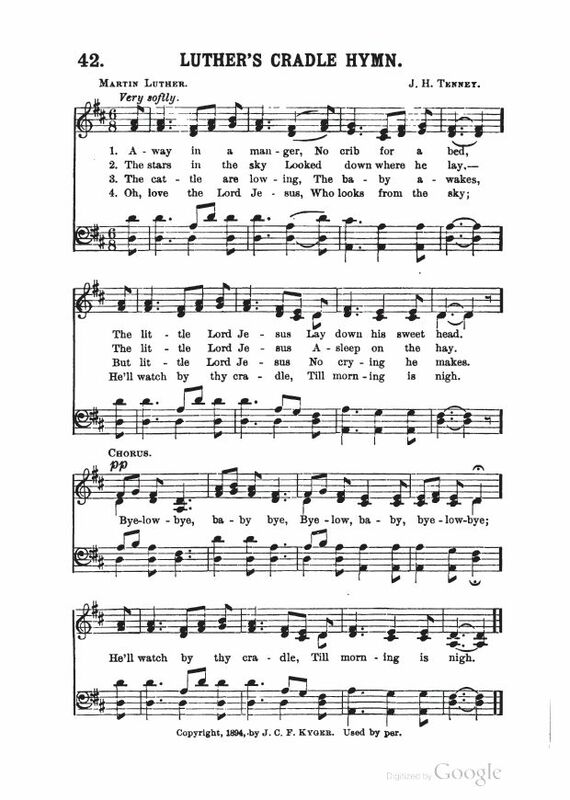 In 1887, it was reprinted by James R. Murray in Dainty Songs for Little Lads and Lasses, Song #113 (New York: J. 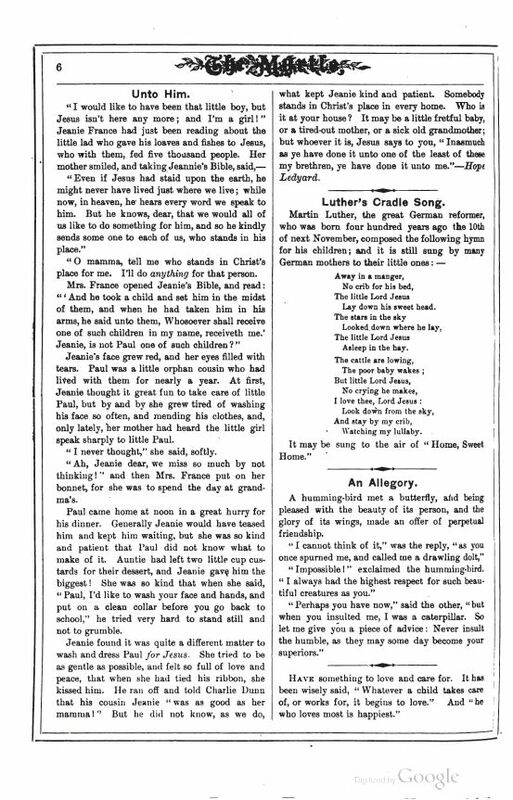 Church Co., 1887), with the subtitle "Luther's Cradle Hymn," and for many years, it was thought to have been the first publication (see right). Murray wrote that the song was written by the German reformer Rev. Martin Luther (1483 – 1546), but this is not correct. The attribution of authorship appears to have been made a few years after the 400th anniversary of Rev. Luther's birth, and as a tribute to him. To be clear, Luther did not write this song; it appears nowhere in his extensive works. 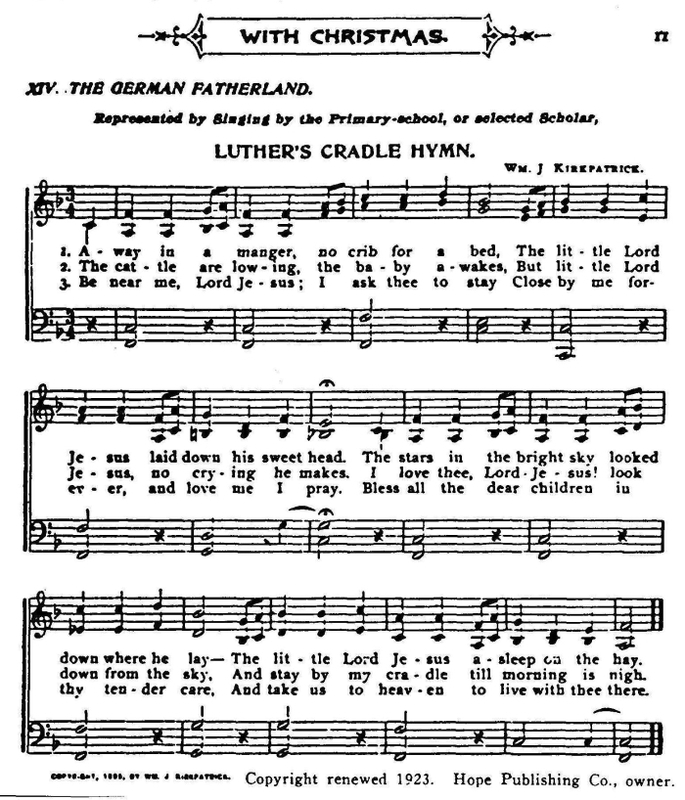 Murray would include "Luther's Cradle Hymn" in subsequent hymnals that he produced. Luther's Cradle Hymn, No. 148, James R. Murray, Royal Praise for the Sunday School (Cincinnati, The John Church Co., 1888). Luther's Cradle Hymn, No. 39, James R. Murray, Little Sacred Songs for Little Singers (Cincinnati: The John Church Company, 1892). The first known printing of the third verse was in 1892 in Gabriel's Vineyard Songs, with a tune by Charles H. Gabriel (I haven't found a copy yet). 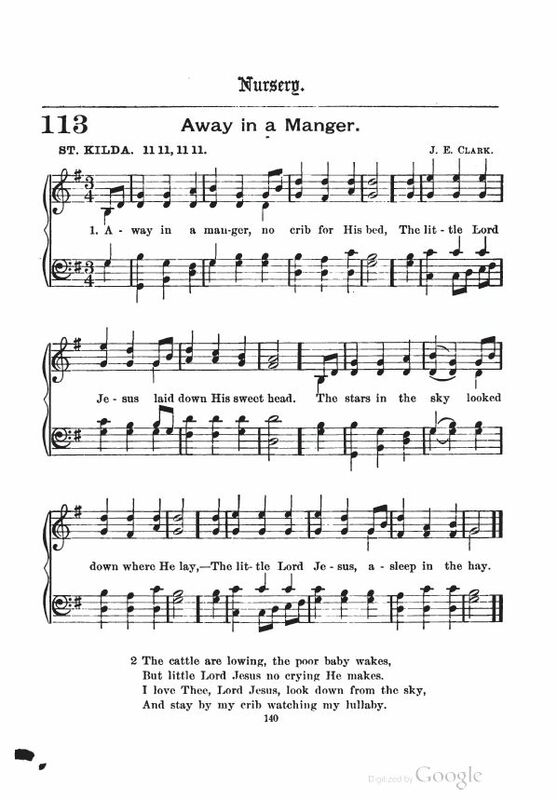 When I was Secretary of the Board of Education, 1904-08, I wanted to use "Away in a manger," which I found with the designation "Martin Luther's Cradle Song," in the Children's Day program one year. It had but two stanzas, 1 and 2. Dr. John T. McFarland, then Secretary of our Board of Sunday Schools, was my near neighbor in his office at 150 Fifth Avenue (New York). I asked him to write a third stanza. He went to his office and within an hour brought me the third stanza beginning, "Be near me, Lord Jesus, I ask Thee to stay." I used it, which was the first time it was ever published. I am pleased to see that it is now being used very widely. The honor of it belongs to that great and good man, Dr. John T. McFarland. John Thomas McFarland, I.L.D., was born at Mount Vernon, Indiana. January 2, 1851, and died suddenly at his home at Maplewood, New Jersey, December 22, 1913 . . . This claim of authorship by Bishop Anderson appears to have been an honest mistake; perhaps the third verse was discovered by McFarland, not written by him (but this is speculation on my part). This claim for authorship in 1904 was 12 years after the printing by Gabriel. In addition, William Studwell, in American Christmas Classics, mentions that the third verse may also be anonymous as the reference was one by McFarland, not of McFarland. Studwell also briefly discusses a Moravian tradition of trombone choirs performing this carol. The setting most popular in Great Britain was by William J. Kirkpatrick, which he published in Around the world with Christmas. A Christmas exercise. Words arranged by E. E. Hewitt. Music by John R. Sweney and Wm. Kirkpatrick. (1895). Oh, love the Lord Jesus, who looks down from the sky. Although some believe this carol was penned by Martin Luther, German religious reformer and author of a number of beautiful hymns, it is almost certainly of late-19th century American origin. Verses 1 and 2 appeared anonymously in Little Children’s Book for Schools and Families, by J. C. File, Philadelphia, 1885, and verse 3 is by John Thomas McFarland (1851-1913). The tune given here is that most used in England, the 'Cradle song' by American Gospel song writer W. J. Kirkpatrick (1838-21). Another popular tune for it in the U.S.A. is 'Mueller', probably written by James R. Murray, 1887. Editor's Note: See The Dear Old Christmas Story, words and music by J. R. Murray, 1884. The Myrtle, Vol. XXXIV, No. 1. (Boston, MA: Universalist Publishing House, May 3, 1884), p. 6. Not So Far Away In A Manger: Forty One Settings of an America Carol By Richard S. Hill, Music Library Association "Notes", December, 1945, Second Series, Vol. III, No. 1. Excellent! Hugh Keyte and Andrew Parrott, The New Oxford Book of Carols (Oxford University Press, 1992), Carol #100, pp. 359-361, two settings plus excellent notes. Ronald M. Clancy, ed., American Christmas Classics, Notes by William Studwell and Ronald M. Clancy. (North Cape May, NJ: Christmas Classics, Ltd., 2001), Carol No. 1, pp. 41-42. This volume, and the three companion volumes in this series, are recommended reading. Please visit Mr. Clancy's web site, Christmas Classics. Ltd. Mr. Clancy is the creator of a great series of videos that trace the histories of numerous classic carols; see Christmas Classics Videos. Note that Christmas Classics Ltd. cheerfully supports the Fisher House Foundation.